To sign up for the latest updates from the Open to All campaign, please enter your name and email address below. The Open to All campaign is supported by a wide array of more than 175 national and state organizations that advocate for lesbian, gay, bisexual, and transgender (LGBT) people, racial justice, civil rights, health and healthcare, inclusive faith, and much more. Contact us if your organization would like to sign on as a supporter of Open to All. If you are a municipal elected official and would like to sign on in support of Open to All on behalf of your region, please fill out this form. 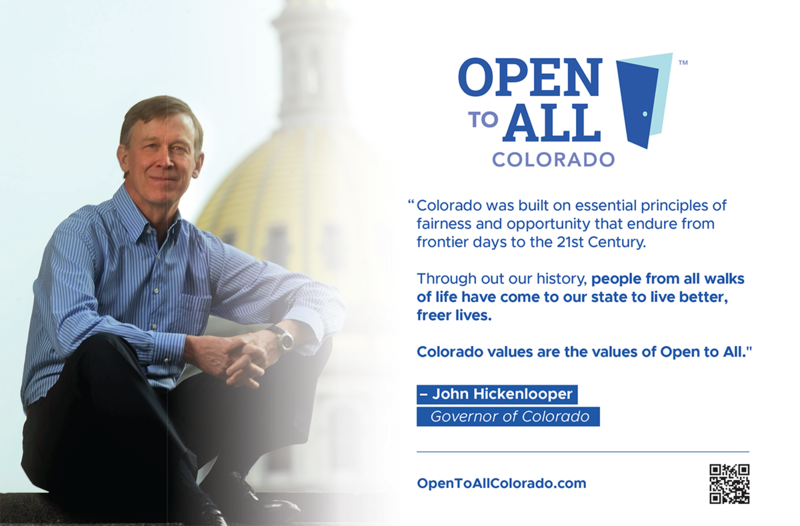 Open to All Colorado is part of the Open To All nationwide public engagement campaign, to build understanding and discussion about the importance of our nation’s nondiscrimination laws—and the bedrock principle that when businesses open their doors to the public, they should be Open to All. Copyright ©2019, Open to All™ 2018. All rights reserved.